I am studying Positive Psychology these days. I put this is the category of “why have I not thought of this before” as a leader and person interested in growing and building thriving organizations. Over time I will write more on Positive Psychology and the application to everyday working life. For today a story for you*. A group of Nuns (180 total) from Sisters of Notre Dame were asked to keep autobiographical journals of their time living in a convent and everyday lives. These women were all born before 1917 and remained Nuns for life. The journals were not set up for eventual scientific study, just as an outlet for these women detailing their vocation. Five decades later a team of researchers gained access to these journals and focused to code the entries for positive emotional content. The question … Could their level of positivity as young women predict how their lives turned out? The answer is yes, a positive outlook lead to a longer life. 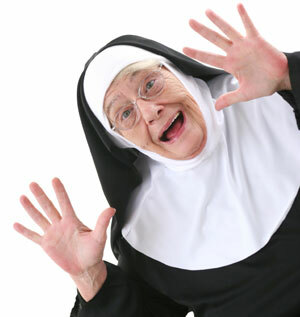 The Nuns with more joyful content lived nearly ten years longer than the Nuns with more negative, even neutral entries. At age 85 (growing up, they all appeared to be at least 85 years old to me), 90 percent of the happiest quartile were still alive. Compare this to 34 percent of the least happy quartile still living. Positive Psychology researchers focus on the age-old question, What came first, the chicken or the egg? So what comes first, success before happiness, or just maybe … happiness leads to success. I think I am just getting started here. Loved your blog today! 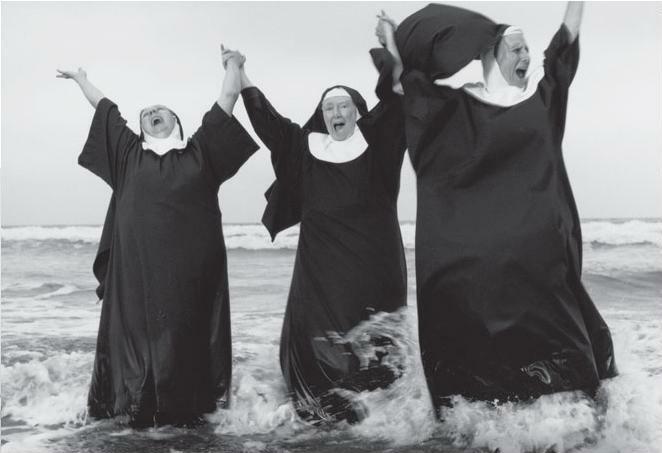 Was it just a coincidence that I also used a picture of happy nuns in the water today on my timeline? We are in the same lane today….. I just checked FB. Wow that is a crazy coincidence! I did not know we choose same picture on same day. A coworker pulled out a nun on a mousepad today. A day for the nuns. The spirit moves us in mysterious ways. “I think I’m just getting started here.” Laughing! I think you are too. I think we need a bit of chicken and egg here Michael. Yea, well down that path, yet always a beginners mind. Happy Tuesday!